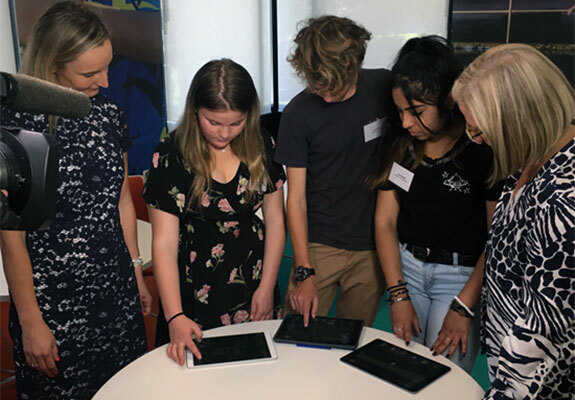 News | Greater Sydney’s next generation is being given the chance to use their creativity to help shape the city’s future, through a new app launched by the Commission, in partnership with the NSW Office of the Advocate for Children and Young People (ACYP). The free app, My Metropolis, is an interactive tool that encourages our younger members of the community to think about what makes an ideal city, allowing them to plan and build elements such as schools, public transport, cafes, places to work and sporting facilities. Chief Commissioner Lucy Turnbull AO and NSW Advocate for Children and Young People, Andrew Johnson, were joined by Commission CEO Sarah Hill to unveil the app to an audience of young people at the ACYP’s Strawberry Hills offices, encouraging them to have their say on the future of Greater Sydney. Lucy highlighted the importance of providing opportunities for children and young people to share their views. “We want to get feedback and submissions from as many Sydneysiders as possible on the future of our city and My Metropolis is a great way for us to engage with children and young people in a way they’re comfortable and familiar with. “It’s their city too and they should have a say in it – it’s just one of the many ways we’re involving young people,” Ms Turnbull said. The app is part of the Commission’s commitment to ongoing and innovative engagement. It will be supported by a survey conducted by the Advocate for Children and Young People. The Commission will be considering survey results along with feedback and formal submissions from a range of other organisations that represent young people in Greater Sydney. My Metropolis is available for download free of charge on iOS or Android.